The year 2017 marks the 100th anniversary of John F. Kennedy's birth. Our youngest elected president, Kennedy brought a sense of youthful energy and idealistic vision to the nation. During his short time in office, Kennedy convinced the us to reach for the stars, faced down Soviet missiles in Cuba, and urged for an end to racism and segregation with the Civil Rights Act. His legacy endures, makinghim one of America's most beloved Presidents. Born in 1917, John F. Kennedy seemed destined for greatness. The 2nd son of a prominent family, JFK became a war hero who captivated the nation and went on to become President. When he was sworn in as the 35th President of the United States in 1961, America fell in love with his youthful charm, good looks, and quick wit. But it was his strong willand political savvy that led an entire nation through trying times, such as the Cuban Missile Crisis, and onto its greatest achievement of landing a man on the moon. His brilliant political career wascut short by an assassin's bullet on Friday, November 22, 1963, in Dallas, Texas. It is difficult for anyone who was not a witness to those sad days to fully comprehend the sense of loss which overtook the nation. Today, on what would have been his 100th birthday, JFK remains one of the most beloved and revered men ever to hold the Office of President of the United States of America. 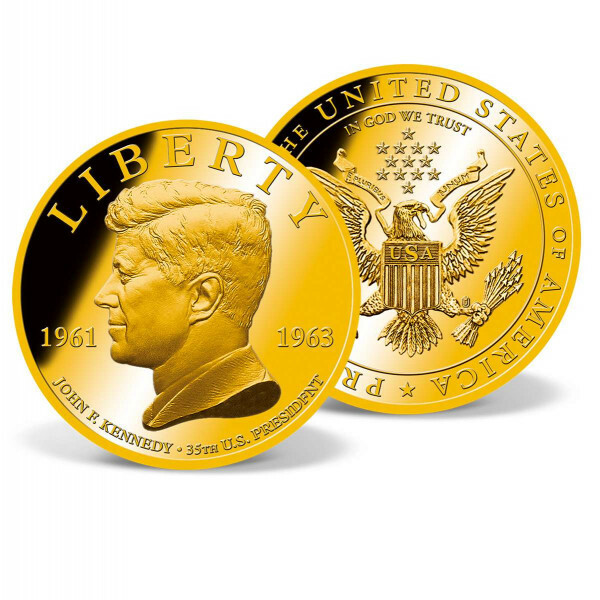 At American Mint, we are marking the centennial of JFK's birth with a special limited release of this exclusive, 24k gold-layered coin.